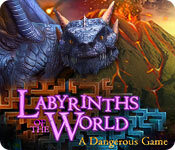 Labyrinths of the World: A Dangerous Game is rated 3.9 out of 5 by 10. Rated 5 out of 5 by peacelilly47 from Stunning Game Love this! Vivid colors are a nice change from so many gloomy morose games I've played. Great characters, story line. Rated 5 out of 5 by deddu from SPECTACULAR GAME This is a long and involved SE game. You and your friend get trapped in a game and visit each world. Charles has developed the game to keep his son alive at great cost. The graphics are very good. The hidden objects vary; there are some interesting twists in the mini-puzzles. For example, the last puzzle is a familiar one match color square to color square but with added pipes to turn correctly. Rated 5 out of 5 by skullfun from ~~DOMINI GAMES CREATE ANOTHER EDITION WHICH MAY SURPRISE YOU!~~ This edition of Labyrinths of the World was a must purchase for me. I am happy to be part of the "fan base" who enjoy Domino games and their creative team. A Dangerous Game is the 7th edition in the series and I still enjoy Labyrinths of the World. In this installment you are on a vacation in Greece with your best friend Christine when you both stumble upon a mysterious board game. Suddenly, you discover yourself in a parallel world with your friend missing. Can you beat the evil mastermind behind this bizarre world, save your friend, and survive this dangerous game? This latest installment immerses the player in a Jumanji-like world, one that is both fascinating and terrifying. The fast-paced storyline is effectively delivered through plenty of actions and rather minimal dialogues. The game board theme is used in a creative way that distinguishes this game from the other exotic fantasy adventures. Domini seems to be able to come up with some creative plot every single time they create another edition to this popular series. 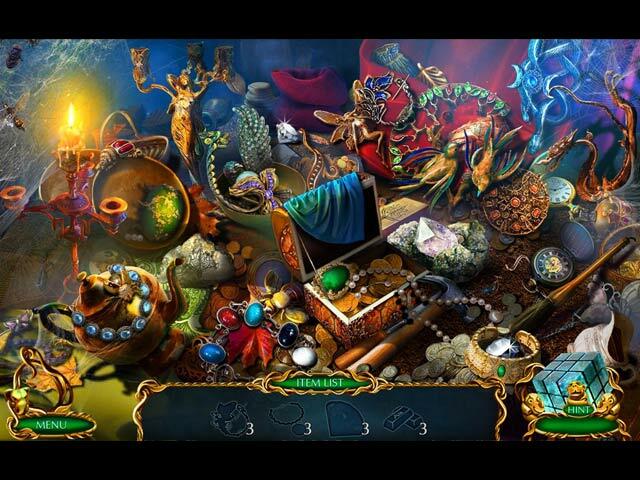 The hidden object scenes are multi-layered, innovative, and fun to play. The game heavily revolves around puzzles, big and small. I enjoy the detailed artwork and interesting scene designs in this sequel. The more subtle soundtrack choices also turn out to suit the game well. I hope fans of this unique series will enjoy this next adventure in the continuing saga of Labyrinths of the World...Cheers! Rated 5 out of 5 by biscuitsmama from A TOSS OF THE DICE TAKES YOU TO THE THREE-WORLDS IN A BRILLIANT NEW GAME Sometimes a vacation turns out to be a bit more than you expected and this one ends up being a three-in-one package. You are on vacation with your best friend when what seems to be a rather boring and uneventful trip suddenly changes into one that might just be the last vacation you ever have. While exploring Delphi your friend Christine sees a stone that appears to have something shining behind it. Of course curiosity gets the better of both of you and that is when the excitement begins. I love the Labyrinths of the World series and, IMHO, this might be the best game of the series to-date. The storyline is excellent and creative with beautiful graphics that bring the three worlds to life. Loving fairy tale type games this game has it all for me with elves, dragons, and trolls. Over the years I have played probably 900 HOPA games and it has become very apparent in the past few years that BFG has set out the basics that each developer should follow such as how many puzzles or HOPS there will be in each game. How many “hot spots” in each scene, what variety there should be in the HOPS, and approximately how many scenes there should be in each game. That format is why so many gamers refer to the HOPA games as being cookie-cutter. When you get right down to it, almost all HOPA games and even TM games are very much cookie-cutter games. That being said, Domini is a developer who makes their HOPS fun and their mini-games a bit more challenging. The graphics in their games are saturated with intense color and their storylines are for the most part quite excellent. This Labyrinths game, A Dangerous Game, is one of the most interesting and different storylines that I have seen in quite some time. This game shows that it is possible to have a very fun and interesting game where there is no vile, dark, evil entity lurking at every turn trying to steal my soul. It is refreshing to see a game that has such a different story that gives me the feeling that I am in a Tolkein novel as I play the game. Congrats to Domini for creating a fabulous game with elves, dragons, and trolls - especially the dragons since I love and collect them. The HOPS are what we would expect but they are done well with a lot of creativity. Many items in the scenes require some interaction with other items that are sometimes not in plain sight and once found they are used within the scene. The puzzles are excellent and although most are familiar, I did come across one at least that I don’t remember playing in quite some time. 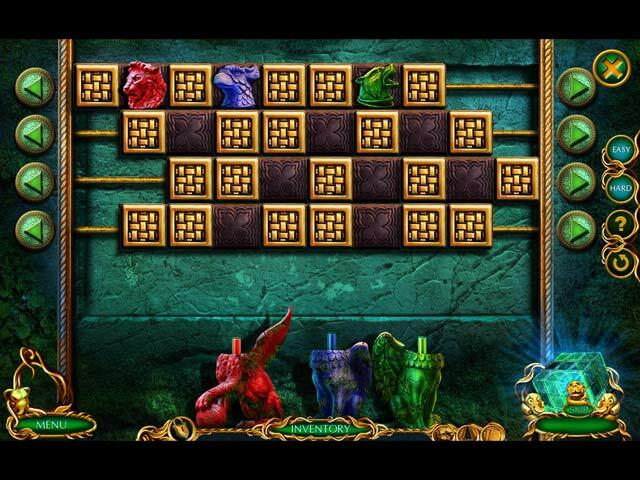 I believe that Domini is the first developer who started offering a choice of easy or hard when it comes to solving the puzzles and even though I have played numerous puzzles in HOPA games, I found that I did need to select the easy mode when I tried to solve two of them in the demo for this game. Labyrinths of the World: A Dangerous Game CE has lots of extras to find including Collectible Cards, Artifacts and Gold Nuggets. Yes there are lots of Achievements to earn if that is your thing. I think that this developer is one of the first that also offered a replay of HOPS and Puzzles in their games and we can do that in the CE version of the game as well. Then there is the usual fluff that is found in all CE games such as Wallpapers, Concept Art, Music, and Videos There is also a Personal Room that we can furnish using those Gold Nuggets that we find throughout the games. All CE games also include a Strategy Guide Bonus Chapter. A Dangerous Game is the seventh game in the Labyrinths of the World series and it is an excellent way to start off 2018. Hopefully, we will see more games like this one and far fewer of the ones with evil demons hoping to take over some unsuspecting person who will become the vehicle for world dominion or some other such purpose. Domini nailed this storyline and created an awesome game that will be one of my all-time favorite games. Even though I love this game and highly recommend it, please try the demo to see if you will enjoy it as well. Happy Gaming! Rated 4 out of 5 by shawnsgrammy from Great except final challenge The last challenge of the game says to "use the number of tubes that are on the light source to connect the tile". Well, that is not what was required at all. You have to cross over that amount of spaces to connect them by the appropriate number. I spent a lot of time trying to do what it said, then finally looked up the solution. Annoyed. Rated 4 out of 5 by ladynextdoor123 from Liked this One I liked the story, even though it's an idea that's been used before. I found some of the puzzles very challenging with the instructions sometimes difficult to fathom, so skipped a few. Music was good and I could relate to the characters. Rated 4 out of 5 by dmessick08 from Entertaining Entertaining for a lazy Sunday. I used a free game credit for this, if I had paid for it I probably would have only given 3 stars, because of the challenge level. It was kind of predictable. Rated 4 out of 5 by pennmom36 from OH IT'S GAME ON CHARLES! I actually really enjoyed this unique storyline, but I do agree with one of the other reviewers, that the colors are a bit much. I understand why they opted for such vivid neon colors, because it's intended to be a fantasy based game, with dragons, trolls and elves, but it can become overbearing. The plot kind of threw my at one point, I was expecting one scenario, thinking I knew the what's and why's, but I was pleasantly surprised that there was a twist I hadn't seen coming. There are 5 Chapters total, and each chapter has just the right amount of length, to keep the story flowing without becoming tedious and boring. Personally, I prefer the CE version over this SE version because to me, the extra money is well spent when I get a lot of collectibles and of course a Bonus Chapter. Here's a recap of my review to help you decide which version, if either is right for you:. A vacation in Greece with your best friend Christine, it just doesn't get any better than this! After a quick tour, the two of you decide to meander through the Sanctuary of Apollo, the site of the ancient Oracle in Delphi. In no time at all, Christine's curiosity gets the best of her when she discovers a hidden cache within the ruins. After a brief lapse of judgement, the dynamic duo discover what appears to be a board game, but this is no ordinary game, this is A Dangerous Game! (:don't roll those dice,Christine, please don't roll those dice, too late, zap! :) I know that a lot of people don't care for this series, but I really love the story lines they come up with. (;and this one would make Robin Williams proud;) For the most part, they are pretty original, and they choose locations that are real, which is a unique concept, and many of these locations are surrounded with conspiracy theories. The Collector's Edition bling is plentiful in the CE version, so you may want to take that into consideration. There are collectible Notes from previous pawns of the game, hidden Artifacts, and lost Deck Cards that give you insight on the characters you meet throughout this wicked game of survival. There are also Gold Nuggets to discover, and can be used to purchase virtual items for a virtual room. There are icons on the inventory bar that light up when one of the collectibles are nearby, and you can click to enable alerts on the interactive map as well. 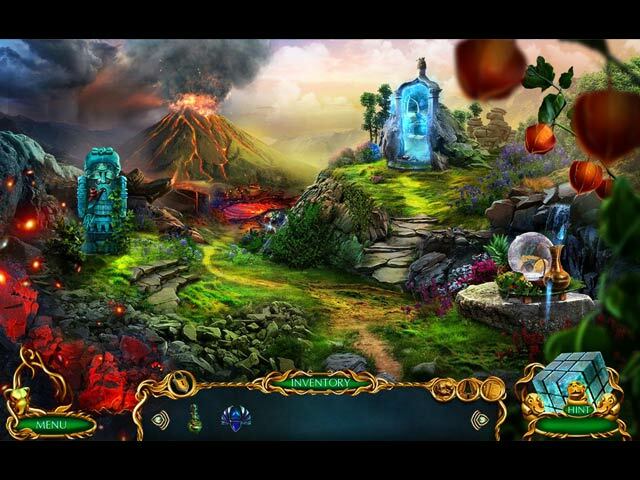 The Hidden Object Scenes are varied, the scenes are clear and bright, and are located in interesting locations. There are Interactive List finds, Silhouetted Shape finds, and Multiple finds, as well as several smaller Zoom Zone HOP's available. You can opt to play a Match 3 game instead of the HOP's. The Mini Games are in abundance, and most are available with an Easy or Hard difficulty mode, which is an awesome feature in my opinion, because you can choose the mode you want on each individual game. There is an option on the Custom Settings page to select either Easy or Hard game modes, which I discovered while playing both versions, that if you select Easy, the games will automatically appear in the Easy mode and vise versa with the Hard mode, however, you can still choose the mode on each individual game, if you want more or less of a challenge. Here are some brief descriptions of some of the games you'll encounter during the demo: 1) Use directional arrows to align the blue tokens so they match the pattern shown. 2) Swap puzzle strips to recreate the image. 3) Light up all points of light from beginning to end without using the same line twice. 4) Choose 3 icons that relate to each character. 5) Use directional arrows to allow each color coded head to drop to its matching colored body at the bottom. 6) Choose the color and then select the puzzle sections to color that must be adjacent to one another. Then click on the sections that need the color removed to match the sample shown. 7) Scan the area to reveal symbols and select the correct symbols in the order shown. 8) Repeat the sequence of flashing eyes by choosing the leaves corresponding to the statue's eyes. 9) Use directional arrows to move the token to the end, if a token passes over a colored cell, the token will teleport to that colors space. LABYRINTHS OF THE WORLD GAMES AVAILABLE Title***Collector's Edition Release Date***Average Rating 1-Shattered Souls (September 6-2014) 4.3 2-Forbidden Muse (June 13-2015) 3.5 3-Changing the Past (January 9-2016) 3.8 4-Stonehenge Legend (August 6-2016) 4.1 5-Secrets of Easter Island (January 5-2017) 3.8 6-The Devil's Tower (April 29-2017) 3.8 7-A Dangerous Game (January 4-2017) 4.0 Other Domini Games: Dark Romance/The Christmas Spirit/Mystery Tales/The Enchanted Kingdom/The Curio Society/Travel Adventures/Island of Death/The World's Legends/In Search of the Lost Temple/Mystery of Ancient Inventors/In Search of Treasure/Fairyland/Tower Builder/Mechanicus/Raxx the Painted Dog/Frozen Kingdom The Collector's Edition version has 21 Wallpapers, 20 Concept Art pictures, 5 Music Soundtracks, 27 Movie Videos, 18 re-playable Hidden Object Scenes, 20 re-playable Mini Games, 32 Achievements to earn, 12 hidden Artifacts to find, 14 hidden Deck Cards (find missing cards to learn about the characters) 63 hidden Gold Nuggets to find (allows you to purchase items for your virtual Beach House room) Missing Note Pages to discover (notes written by previous players) a built in Strategy Guide and a Bonus Chapter, enjoy!